At the beginning of the year an injured wild dog was transported to HESC and was treated by Dr Rogers. He had been severely bitten in the dorsal area (haunch/hind legs) and needed veterinary care. Dr Rogers darted the animal and stitched him up before placing him in quarantine – this is where we keep all animals in need of high care treatment. Since then, the wild dog has healed and the team at HESC has been planning his release back in to the wild. The plan was to pair him with the three male wild dogs before releasing them together. Unfortunately, the three males did not pair well with the rescued wild dog. 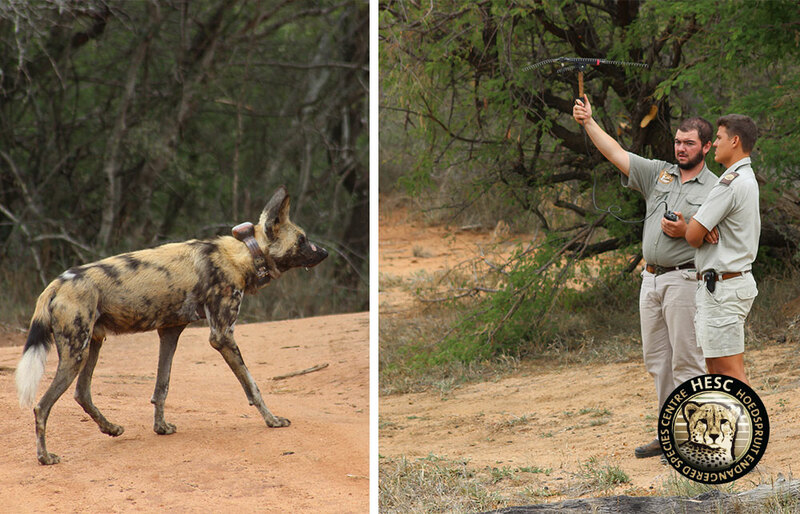 The plan was reassessed and the decision was made to pair the rescued wild dog with another single male. The first step, was to move the two dogs next to each other as the team at HESC wanted them to get use to each other before introducing them. After a couple of days, the behavior between the two was amicable and we opened them up to a single enclosure. Thankfully, there was no aggression between the two and after monitoring them for a few hours it was established that the pairing was a raging success. Once the pairing was done, it was time to plan the actual release. This also entailed sourcing tracking collars. Allied Nutrition came to our rescue and we are extremely grateful for their generous donation towards the collars. 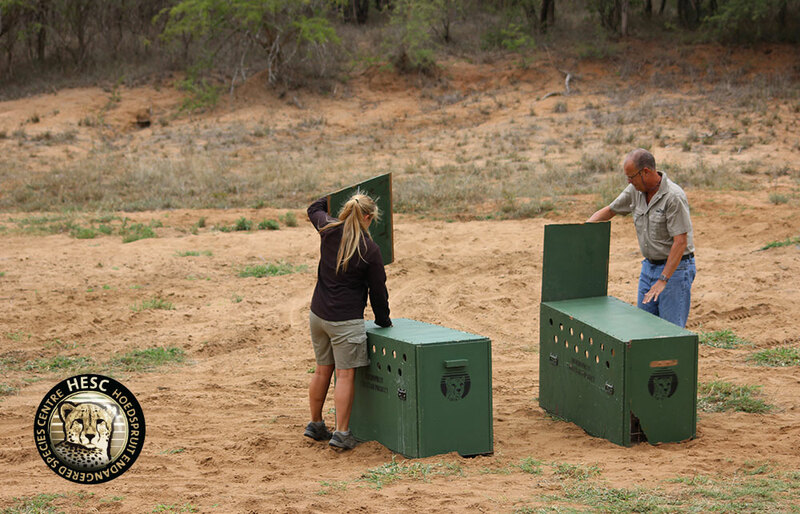 Such a release would not be possible without us being able to track the progress of these wild dogs. Kapama Game Reserve was the selected venue for the release as female wild dogs have been spotted there before. It thusly felt to be the perfect place. A release is always a great time at HESC as this is exactly what we work towards. On the release day (11 December 2017) Dr Rogers came in and darted the two dogs DNA testing was done shortly afterwards and the sponsored collars were attached. 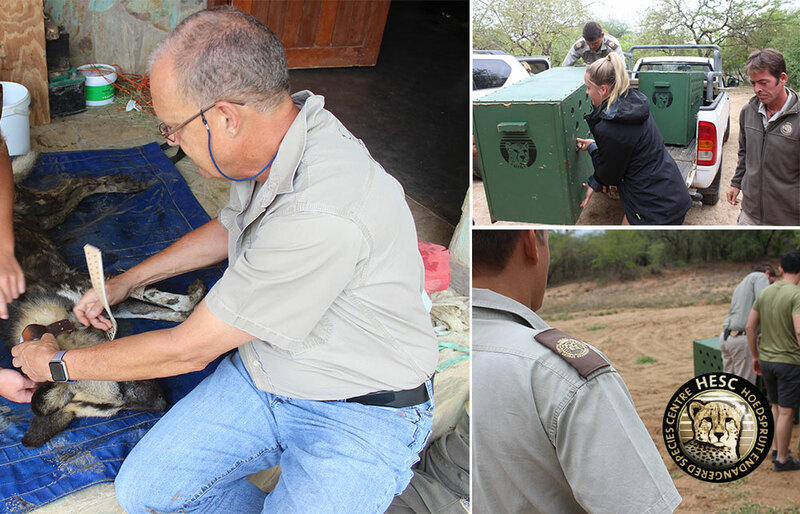 The two dogs were then loaded and transported to an open field in the Kapama Game Reserve. The HESC Volunteer Program, Camp Jabulani (who will be monitoring their movements on the Kapama Game Reserve and referring the information back to HESC) as well as the HESC team were present to watch this special occasion. The crates were offloaded. Everyone held their breath and stood back as Linri and Dr Rogers had the honors of opening the crates. Within seconds they were out and heading off together into the bush. Everyone was able to see them for a couple of minutes just beyond the tree line, before they made their way out of sight. Karel and Duncan who have been helping with the planning of the release then brought out the antenna to track the dogs for a few minutes. HESC exclaimed their joy at the release of these two males. The hope exists that they thrive together out in the wild. HESC will keep monitoring them and keep you updated on how they are doing. Great job, as usual. May they live long and well.